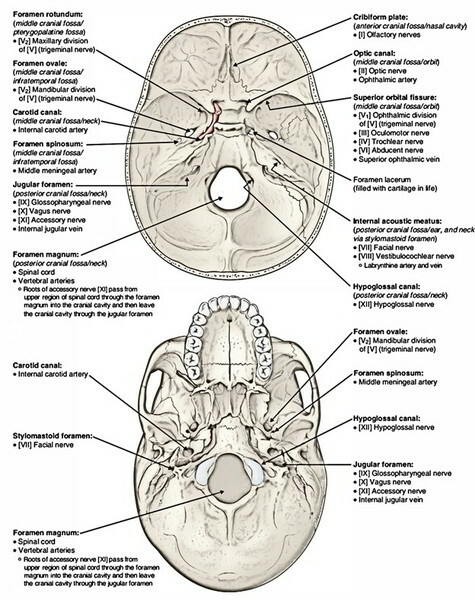 The posterior cranial fossa is located behind the superior border of the petrous temporal bone and the dorsum sellae of the sphenoid and is the deepest of all cranial fossae. It lodges the hindbrain being composed of cerebellum, pons and medulla oblongata. It’s created by portions of the sphenoid, temporal, parietal and occipital bones. The posterior cranial fossa is limited above by the tentorium cerebelli (a wide tent-shaped fold of the dura mater) which intervenes between the occipital lobes of the cerebral hemispheres above and the cerebellum below. 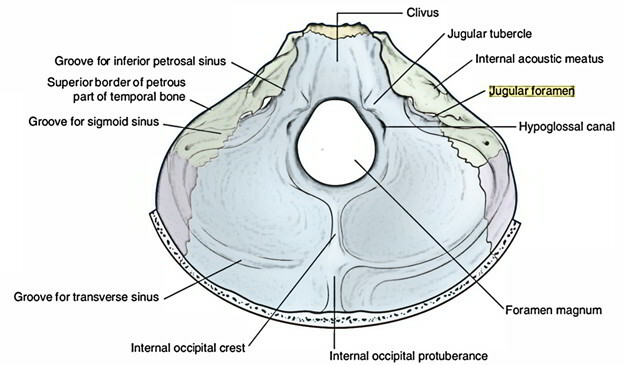 Clivus, a sloping surface in front of foramen magnum, created by the fusion of the posterior part of the body of sphenoid with the basilar part of the occipital bone. It’s divided from the petrous temporal bone by petro-occipital fissure which finishes posteriorly at jugular foramen. Foramen magnum, the largest foramen of the skull, is within the bottom part of the posterior cranial fossa. On every side of the foramen magnum a little above the lateral margin of its anterior part is located the hypoglossal canal. Internal occipital crest: It’s a vertical bony ridge, running downward from the internal occipital protuberance to the foramen magnum. Internal occipital protuberance: It’s situated opposite to the external occipital protuberance. 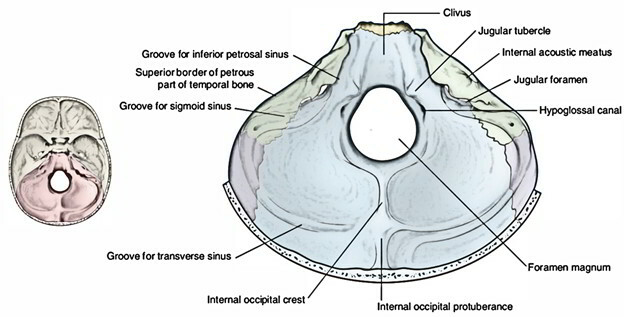 Grooves for the transverse and sigmoid sinuses: The grooves for the transverse sinus, 1 on either side, run laterally from the internal occipital protuberance to the mastoid angle of the parietal bone where it becomes continuous with the groove for the sigmoid sinus which finishes into the posterior part of the jugular foramen. Cerebella fossa on every side is located between the transverse and sigmoid grooves and the foramen magnum. Fossae for occipital lobes 1 on every side are located above the groove for the transverse sinus. Internal acoustic (auditory) meatus: It’s a bony canal in the centre of the posterior surface, being located just about directly medial to the external acoustic meatus. The meatus is all about 1 cm in length. Subarcuate fossa, an indistinct depression lateral and above the internal acoustic meatus. It includes dural fold and some blood vessels. Aqueduct of vestibule, a slit behind the internal acoustic meatus. It carries the endolymphatic duct of the internal ear. Cochlear canaliculus, a notch in the lower border of the posterior surface of the petrous bone, just above the anterior end of the jugular foramen. It lodges the cochlear canal. The posterior surface of the petrous temporal bone is triangular and has 3 edges: superior, inferior and posterior. 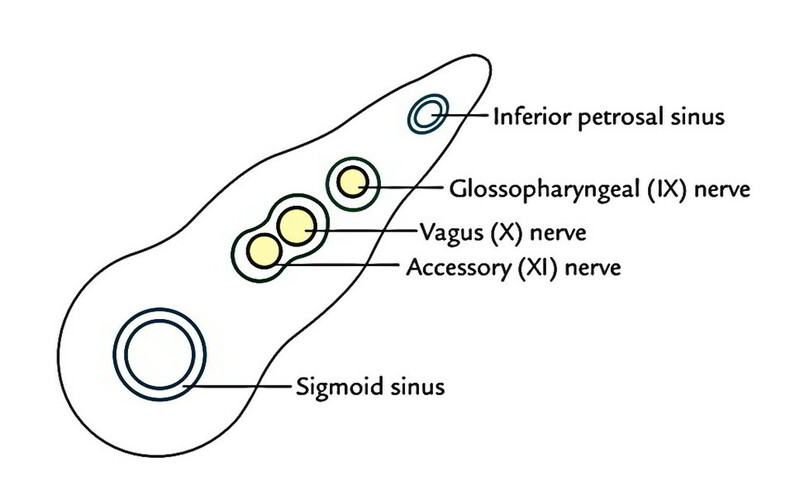 Every border is related to a dural venous sinus: the superior border to the superior petrosal sinus, the inferior border to the inferior petrosal sinus and the posterior border to the sigmoid sinus. It can be split into 3 parts: anterior, middle and posterior. Anterior part: Inferior petrosal sinus. Middle part: In the anteroposterior direction. The tenth and eleventh cranial nerves are encircled in a standard sheath of the dura mater on the other hand the 9th cranial nerve has a separate sheath of the dura mater. Meningeal branch of the ascending pharyngeal artery. (Only occasionally present in thelower part of the sigmoid groove). Emissary vein: attaching the suboccipital venous plexus to the sigmoid sinus. Meningeal branch of the occipital artery. Upper longitudinal band of the cruciform ligament of atlas. Membrana tectoria: a continuance of the posterior longitudinal ligament of the vertebral bodies. Medulla oblongata: together with its meninges, i.e., dura mater, arachnoid mater and pia mater. 2 posterior spinal arteries (left and right). Sympathetic plexus around the vertebral arteries: this plexus is composed of postganglionic sympathetic fibres originated from the inferior cervical sympathetic ganglion. Tonsils of cerebellum project on every side of the medulla oblongata into the large posterior part of the foramen magnum. The hemorrhage in the posterior cranial fossa doesn’t become apparent at once, unless the basilar part of the occipital bone is fractured and the mucous membrane of the pharyngeal roof is torn.